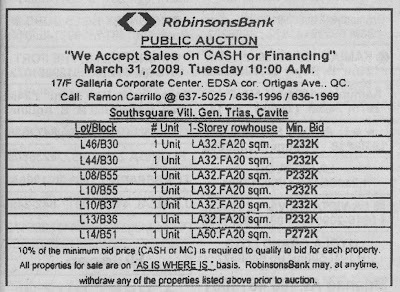 RobinsonsBank shall be having a public auction on March 31, 2009, Tuesday, 10:00 A.M., at the 17/F Galleria Corporate Center, Edsa cor Ortigas Avenue, Quezon City, Philippines. The properties for sale through public auction consists of 1-Storey row houses located at Southsquare Village, General Trias, Cavite. 10% of the minimum bid price in cash or manager’s check is required to qualify to bid for each property. All properties are for sale on an “AS IS WHERE IS” basis. Payment terms can be through cash or financing. You may call them up using the numbers listed on the ad to get more details. You may refer to this post to get an idea of what questions you should ask if you are seriously considering buying any of these properties. Since the listing includes very few properties, I suggest you give them a call as soon as possible. I already checked their website to see if this is also listed online but I found repossessed cars instead. If you have a friend who wants to start investing in foreclosures and could use some help, you can also share this to them through e-mail, just use the add-to-any button below.